I would like to thank everyone who participated in our survey this month we were thrilled to get such a great response. The winner of the wonderful Treasury Gift Voucher was Graham Francis, CEO of SwanCare. Congratulations Graham, enjoy the Treasury. We believe survey’s are vitally important to ensure we constantly deliver high quality information and product and most importantly that we listen to what YOU want. We would like to conduct further surveys, from time to time and as we know your time is valuable so we will make sure they are short and engaging. Can you believe that the Easter eggs are already in the supermarkets! I know for many of you, due to the royal commission it has been a hectic start to the year so Easter is a good chance to have a break and recharge the batteries before getting stuck into the rest of the year. This time of the year also means the launch of new products and showrooms, so the design team have been busy looking and evaluating all the wonderful new products on offer. 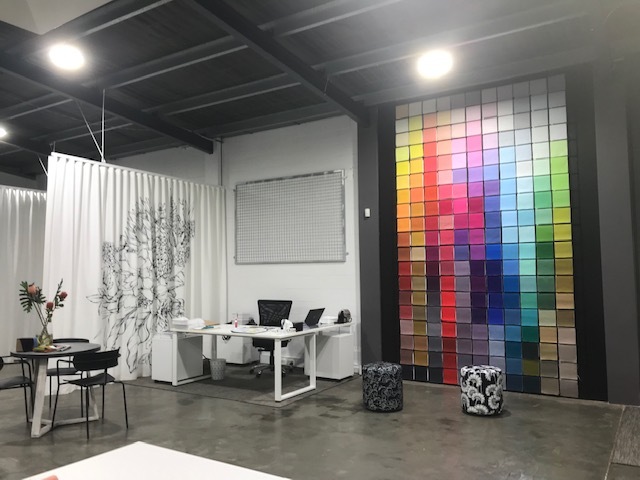 They also attended the launch of the new Materialised showroom and I believe what is now on offer allows them better opportunities to design bespoke fabrics and wallcoverings. This means more exciting product to offer all our clients.